Q. Can I operate more than one control simultaneously? A. The Velbus domotics system only sends a command when a pushbutton is being pressed or released. Example: The bus is empty when a lighting point is being dimmed so simultaneous commands will not pose any problem. Q. How does Velbus handle daylight saving time? A. Only if you have a VMBHIS Home Center server in your installation will daylight saving time be automatically adjusted. In case no VMBHIS is present in the installation, the time has to be adjusted manually. This can be done on one of the modules with a display (eg. the VMBGPOD), or by using the clock sync function in Velbuslink. Q. Where can I view a demo of the Velbus system? A. Please consult the Points of Sale page, those who have a demonstration panel are marked with an icon. Q. The LEDs on my module(s) are flashing, what does this mean? Q. What happens to the date and time after a power blackout? A. The VMBHIS Home Center server is thé solution for controlling Velbus by means of iPhone, iPad, iPod Touch, smartphone, tablet and pc. The VMBHIS is fully plug-and-play en adds also other extras to your Velbus installation. For more information see the VMBHIS product page and homecenter.be, for prices see Velbus price list. Included in the price are the module, the software and one year free updates, after which the VMBHIS remains fully functional. Updates are only needed in case you want to incorporate newly developed functionalities, and can be bought at any time. The purchase will include again updates for a year and all previous updates. Q. Which cable type do I use with my Velbus installation? A. A UTP cable will be more than suitable for a regular home automation. Extensive installations (covering large distances >100m) will need EIB cables. This cable type has a larger wire gauge so the loss over larger distances will be negligible. We also recommend using a power voltage of minimum 14V, which is perfectly feasible when using a Velbus power supply. A. To realize logical functions and advanced programming, we will use combinations of actions in Velbuslink, often using one or more virtual relays. A. Collapsing and expanding the module in question will solve this problem in most cases. This makes Velbuslink request the statuses of the channels again. Beware that Velbus only responds to commands being transmitted on the bus. When eg. in the afternoon you configure a program step that is activated each morning, it will only come into effect from the next morning on. A. When I push the "ALL OFF", all lights have to go out. But if it's dark outside, the driveway light has to remain on for another 5 minutes. A. When a door is open for longer than 60 seconds, a siren should go off. Q. My program steps do not seem to work? A. First of all, beware that Velbus only responds to commands being transmitted on the bus. When eg. in the afternoon you configure a program step that is activated each morning, it will only come into effect from the next morning on. Second, in order for your program steps to work, the respective program has to be active. Velbus input modules can have up to three programs (program 1, 2 and 3), each of which can contain multiple program steps. At any one time, only one of the three programs (or none of them) can be active. 2. By means of push buttons or other Velbus initiators. 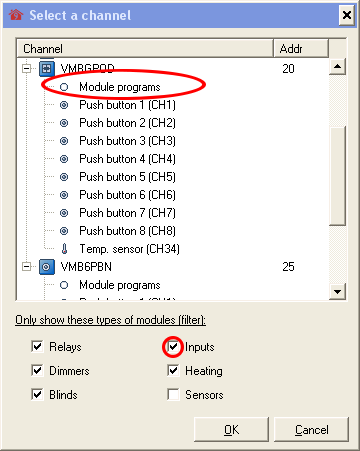 To do so, define a new action and select as subject the input module -> "Module programs" (see screenshot below). This will make a whole array of actions available that are related to programs, amongst others selecting the active program. If the input modules aren't visible, activate the "inputs" filter (see image above). If you only want to activate or deactivate the program steps of one specific push button, select as subject this push button channel. Q. A delay can be set on multiple locations. What are delays used for? A. If you have defined a double action for an entry (push button), you can set the time on which the second entry will be virtually activated and not the first one. This time can be set at 1, 2 or 3 seconds. When using a push button for functions requiring a long press, you may want to set the time corresponding to that long press between 1 and 2 seconds. Every dimmer will make a distinction between a short and a long press. In some situations however, you'd rather the entry did not react immediately. A push button with the function "everything off" is a good example. In this case, you could set the reaction time of every entry (push button) between immediate, 1, 2 and 3 seconds.This is the time the entry will wait before reacting when pushed. This way, accidentally pushing the "everything off" button will not trigger any action. Another possible setting is never. When setting this delay, the entry (push button) will no longer work (neither will it from its programs). Q. How can I use the astronomical clock? Q. How can I close a Velbus relay during a very short period (<1s)? A. Normally in Velbus a relay cannot close for less than 1s. This will cause relay channel 1 to close and open again very rapidly. (The button starts the two relay channels at almost the same time, after which the second relay channel almost immediately turns off the first). Q. Can I run Velbuslink on a Mac? A. Velbuslink runs only on Windows. In iOS you can use Boot Camp to install a Windows environment on your Mac. A. See the VMB1RYNO FAQ. A. Actions related to channels can be copied to another channel. To do so, press and hold the Ctrl button on your keyboard, and (without releasing the Ctrl button) drag and drop the source channel onto the destination channel. (Release the Ctrl button after relasing the mouse button). The actions of the source channel will be added to the existing actions on the destination channel. In Velbuslink 9.82 and higher you can also rightclick the source channel -> Actions -> Copy. A dialog will open where you can select the destination channel. A. First put Velbuslink in Advanced mode (menu Tools > Advanced). Then right-click on the module and select Advanced > Firmware upgrade. A. If you wish to set a weekly program for your VMB1TS sensors without using a VMB1TC controller, you can use push buttons and program steps on input modules instead (eg. on a VMBGPOD glass controller module). A. 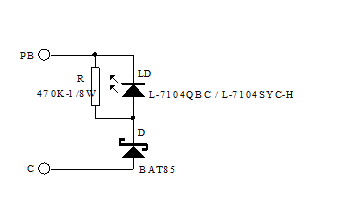 A blind is connected to a VMB2BLE channel. Its two limit switches (above and below) are connected to two VMB7IN input channels. Q. How do I connect sensors to the VMB4AN? A. Up to 4 sensors can be connected to the VMB4AN using the "analog in" connections. For resistance, 0-10V and frequency sensors connect one wire to the COM input and the other to the 1, 2, 3 or 4 input. For current sensors (0-20mA), connect the + of the sensor to the + (power supply) of the VMB4AN, and the - of the sensor to input 1, 2, 3 or 4. The type of each sensor (resistance, 0-10V, 0-20mA or frequency) is configured using Velbuslink. If the sensor needs a 24V DC power supply, this can also be supplied by the VMB4AN using the leftmost 4 connections. If the sensor has 3 wires, 2 of them (typically those that have the same color) have to be connected together. - right-click on the dimmer channel and select "operate"
- set the current dimvalue to 1%. Leave this value at 1% for the rest of the process. - in the configuration settings, enter a minimal dimvalue of 0,1V and synchronize > write this new setting. If the lamp functions as desired, leave the setting as is. - If the lamp does not function as desired, increase the minimal control voltage (in the configuration settings) a little, synchronize > write the new value and check whether the lamp works correctly. - repeat the previous setting until the ideal minimal control voltage has been found. It might be advisable to let the lamp heat for a while by putting it fully on, then check again if the minimal control voltage is correct. Q. Making the same button switch a light on/off at 70% luminance during the day and at 40% during the night? Q. How can I connect a feedback LED to VMB8PBU buttons? A. See the diagram below. "C" should be connected to the VMB8PBU COM, "PB" to the push-button connection of the relevant channel. A. I have a light circuit connected to a VMBDMI(-R). When the lights are dimmed out, they keep on emitting a bit of light. To solve this problem, put a relay (eg. of a VMB4RYNO module) between the dimmer and the lamp. Then create an action "Momentary (follow)" with the dimmer as initiator, and the relay as subject. This relay will always be closed, except when the dimmer is set to 0%. A. If the connected led lights are in accordance with the specifications of our dimmer but do not dim correctly (eg. buzzing, flickering, turning off by themselves, ...) an electronic pre-charge may possibly be a solution. The electronic pre-charge is specifically useful in case of induction, or if the load is not high enough. - set the current dimvalue to 1%. Leave this value at 1% for the rest of the proces. - in the configuration settings, enter a minimal dimvalue of 1% and synchronize > write this new setting. If the lamp functions as desired, leave the setting as is. - If the lamp does not function as desired, increase the minimal dimvalue (in the configuration settings) by one or more percent at a time, synchronize > write the new value and check whether the lamp works correctly. - repeat the previous setting until the ideal minimal dimming value has been found. It might be advisable to let the lamp heat for a while by putting it fully on, then check again if the minimal dimvalue is correct. Q. Are the VMBGPFC no longer available? A. These mounting frames are available from BTicino with the model no. LN4702BG. Remark: the holes in these are slightly larger than the previous version LN4702GL. The current glass panel production has been adapted to the new holes. In case you receive a glass panel with smaller mounting pins on the backside, you can slightly enlarge them eg. by using tape. Q. With the Home Center licence, will I be able to control my Velbus domotics system from 5 different places or do I need extra licences? A. With the standard Home Center licence up to 4 simultaneous connections are allowed. Extended licences can be bought from the Stijnen Solutions website homecenter.be > webshop. Q. I recently mounted the blue feedback LEDs (VMBLDB). However, sometimes I do get false commands as if someone controls the pushbutton. What am I doing wrong? A. It is important to respect the polarity (white = common) when connecting these feedback LEDs. These LEDs will light dimly when deactivated and light brightly when activated. Connected wrongly, the LEDs will periodically react falsely as if the pushbutton has been depressed.